His Highness the Aga Khan III, Hazrat Imam Sultan Mohamed Shah was born on Friday November 2, 1877 at "Honeymoon Lodge" in Karachi. His birth was an occasion of immense joy for the family and particularly his grandfather, Hazrat Imam Hassanali Shah, Aga Khan I, who named him "Sultan Mohammad." August 1885 Aga Shah Aly Shah, our 47th Imam, passed away at Poona, India. He was buried at Najaf, Iraq, which also the burial site of our first Imam, Hazrat Ali. 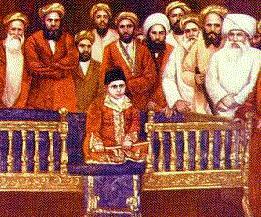 Mowlana Sultan Mohamed Shah ascended the throne of Imamat in Bombay, India at the tender age of 7 years, 9 months and 16 days. During the first Mulaqat with the Jamat declared, "O Jamat do not consider Me small...."
There were many Ismailis in the congregation who were sad at the passing away of Aga Shah Aly Shah.The new young Imam noting the sadness in the faces of those around him at the recent death of his father had said "Why are you sad? The Imam is sitting in your midst and doing your work." 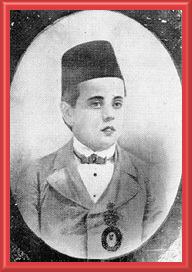 September 1885 - During this first month of Imamat, Mowlana Sultan Mohamed Shah gave Holy Deedar to the Bombay Jamats various times and made many Holy Farmans for the worldly and spiritual betterment of the Ismailis. Mowlana Sultan Mohamed Shah was bestowed with the title of "His Highness" by the British Government in recognition of the services rendered by the Aga Khan family. April 10, 1889 - Mowlana Sultan Mohamed Shah gave Holy Deedar to the Jamat and made Farman relating to the story of Hazrat Musa and Hazrat Khizar. Mowlana Sultan Mohamed Shah was called upon to settle major riots between Muslims and Hindus. Owing to his influence, his followers not only refrained from participating in riots but helped the authorities in restoring peace and order. They gave shelter to a number of Hindus although two of His Royal Highness's personal servants had been killed in the riots. In Bombay, Poona, Kutch and Kathiawar, huge camps were opened by His Royal Highness and they remained open for nearly six months. The hungry and the destitute in thousands found sustenance and shelter at these centers at the expense of the benevolent Prince Aga Khan III. December 1893 - Mowlana Sultan Mohamed Shah gave Holy Deedar to Manjevadi Jamats various times and made Farmans for the worldly and spiritual betterment of Ismailis. February 1896 - Mowlana Sultan Mohamed Shah gave Holy Deedar to the Jamats of Ahmedabad, India for various days and made Farmans for the worldly and spiritual betterment of Ismailis. Mowlana Sultan Mohamed Shah attended the Diamond Jubilee of Queen Victoria in England. Mowlana Sultan Mohamed Shah married Shahzadi Begum, his cousin and the daughter of Aga Jungishah. Summer 1897 - Bombay, India was struck by bubonic plague, Mowlana Sultan Mohamed Shah had himself publicly innoculated in order to encourage Ismailis and others to follow suit. 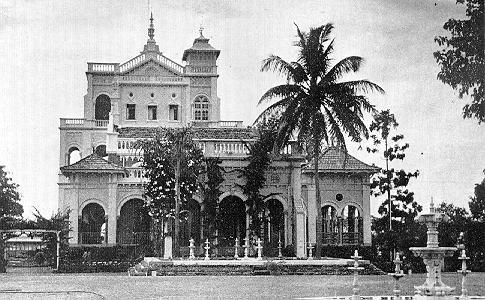 Yeravda Palace at Poona was built by Mowlana Sultan Mohamed Shah at a cost of nearly half a million rupees to provide a means of livelihood to the famine stricken people.